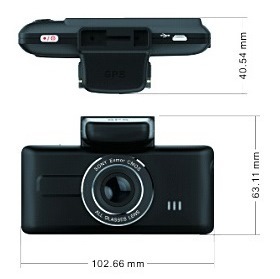 The MateGo MG380G dashboard camera was released in mid 2014 by the Chinese company Shenzhen Onstar Technology Co. Ltd. This is the same manufacturer that produces the popular Panorama series of dash cams. 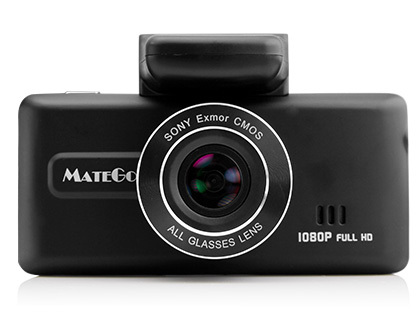 The MateGo MG380G is based on the CSR Zoran Coach 12P Processor and the Sony Exmor IMX322 CMOS sensor. Dash cameras running the Exmor IMX322 CMOS sensor have some of the best night footage available today and this camera is no exception. The MG380G has excellent video quality during the day and good video quality at night while running at a bitrate of 15 Mbps. Note that some owners have indicated the colors are a bit muted. While the colors are not as vibrant as some other cameras, this camera does a very good job of picking up details. The primary negative with this camera is it’s size. The MG380G has a 2.7″ screen and the camera is not the most discreet at 103mm x 63mm x 41mm. Also, since this model is manufactured for the Chinese market, the level of support is less than the branded versions of this product. While the camera has buffered parking mode (5 seconds before motion / impact) when hardwired you need to manually set motion detection on when parking which is not the most convenient. This camera is very popular and sells under a number of different brand names as well. These models may have more refined firmware, better support and perhaps some hardware differences (not confirmed) but sell at a premium price. Note that there is a similar looking camera called the Matego MG300K. The primary difference is that it uses the Aptina AR0330 CMOS sensor rather than the Sony sensor. For the small price premium, it makes sense to get the MG380G due to better video quality. The microUSB port on this camera is a factory service port only (not for transferring files, or power). While the camera will power on via microUSB port, the recordings won’t start automatically and the capacitor will not charge. Only use the included 12V cigarette lighter port adapter charger for dash cam use. The MateGo MG380G officially supports up to 32GB cards, however the camera’s firmware has the capability to perform exFAT formatting. This allows the use of 64GB and higher SD cards with this camera. To use this feature, it is important to format the card in the camera. The MateGo MG380G is a good buy given its excellent video quality, low price and full features . This camera comes with a lot of features and decent video quality for $130 but it is not the most discreet. If you want a discreet camera consider the Mini 0805. The best place to purchase from is Amazon. The latest firmware can be downloaded from the MateGo website. A direct link to the MG380G Firmware is here. Final Word The MG380G is a good buy given its excellent video quality, low price and full features . Just a bit large.